It has just got harder to spend a penny in Turriff. It was brought up at last nights meeting of Turriff and District Community Council, that Aberdeenshire Council have permanently closed the recently renovated public toilets at The Haughs. The reason for closure is apparently lack of use, how this has been measured when the toilets are closed from October through to March I’m not quite sure. Cllr Alisan Norrie and Elaine Brown, the Formartine Area Manager, were both at the meeting but were unable to provide any information about when or who had decided on the closure. The toilets at the Haughs are ideally placed for the play park, anyone with children knows you can’t go more than 500 yards or 5 minutes without one of the children needing to go to the toilet. Asking parents to pack up their children and then head off to the sports centre or in to town to use the toilet isn’t really ideal. please can you advise when this decision was made? How did you determine if they are under used? There are only two toilets at the sports centre and its not very easy with three small children to rush them all that way from the playpark to use a toilet. Ms Brown told the meeting that the facilities had been closed due to lack of use, but was unable to say how this was measured or who had made the decision. She went on to tell the meeting that a sign would be placed on the closed toilets directing people across the road to Turriff Sports Centre. On checking this morning I found that a sign has already been attached to the door of the toilets, directing people to the attended public toilets at High Street. Turriff once had three excellent public toilets, Duff Street, now destined to be a takeaway or house, The Haughs and High Street. Now only High Street remains open. If you do manage to make it from The Haughs to High Street you will no doubt be delighted to find out that these toilets are now free to use, with the 20p charge being removed at the end of March. With the removal of the 20p charge at High Street you may wonder how long this will remain an Attended Toilet, will Aberdeenshire Council continue to employ an attendant for a facility which generates no income? 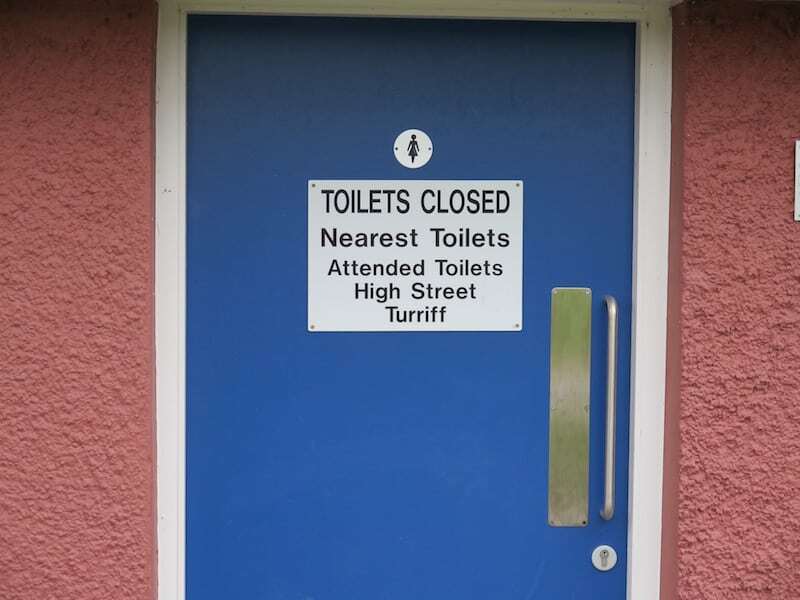 Turriff and District Community Council asked the Formartine Area Manager to find out if it was possible that the Haughs toilets could be reopened for events such as May Day, The Turra Show etc. I’ve been searching the Aberdeenshire Council website for more information about the closure but all I have managed to find is this page http://www.aberdeenshire.gov.uk/leisure-sport-and-culture/tourists-and-visitors/public-toilets/formartine/ which still lists the toilets as being open. I’ve asked Aberdeenshire Council for more information about the closure of these public toilets and will update this once I receive a response.